The Catskill Mountains, also known as the Catskills, are a physiographic province of the larger Appalachian Mountains, located in southeastern New York. As a cultural and geographic region, the Catskills are generally defined as those areas close to or within the borders of the Catskill Park, a 700,000-acre (2,800 km2) forest preserve forever protected from many forms of development under New York state law. Geologically, the Catskills are a mature dissected plateau, a once-flat region subsequently uplifted and eroded into sharp relief by watercourses. The Catskills form the northeastern end of the Allegheny Plateau (also known as the Appalachian Plateau). The Catskills are well known in American culture, both as the setting for films and works of art, including many 19th-century Hudson River School paintings, as well as for being a favored destination for vacationers from New York City in the mid-20th century. The region's many large resorts gave countless young stand-up comedians an opportunity to hone their craft. In addition, the Catskills have long been a haven for artists, musicians, and writers, especially in and around the towns of Phoenicia and Woodstock. Nicolaes Visscher I's 1656 map of New Netherland located the Landt van Kats Kill at the mouth of Catskill creek. The region to the south is identified as Hooge Landt van Esopus (High Lands of the Esopus), a reference to a local band of northern Lenape Native Americans who inhabited the banks of the Hudson and hunted in the highlands along the Esopus Creek. While the meaning of the name ("cat creek" in Dutch) and the namer (early Dutch explorers) are settled matters, how and why the area is named "Catskills" is a mystery. Mountain lions (catamounts) were known to have been in the area when the Dutch arrived in the 17th century and may have been a reason for the name. The confusion over the origins of the name led over the years to variant spellings such as Kaatskill and Kaaterskill, both of which are also still used: the former in the regional magazine Kaatskill Life, the latter as the name of a mountain peak and a waterfall. The supposed Indian name for the range, Onteora ("land in the sky"), was actually created by a white man in the mid-19th century to drum up business for a resort. It, too, persists today as the name of a school district and as the name of a Boy Scout summer camp (Onteora Scout Reservation). The Pocono Mountains, to the immediate southwest in Pennsylvania, are a part of the Allegheny Plateau. The Catskills contain more than 30 peaks above 3,500 feet (1,100 m) and parts of six important rivers. The Catskill Mountain 3500 Club is an organization whose members have climbed all the peaks in the Catskills over 3,500 feet (1,100 m). The highest mountain, Slide Mountain in Ulster County, has an elevation of 4,180 feet (1,270 m). Climatically, the Catskills lie within the Allegheny Highlands forests ecoregion. Kaaterskill Falls on Spruce Creek near Palenville, New York. One of the higher falls in New York. Two separate falls total 260 ft (79 m). Although the Catskills are sometimes compared with the Adirondack Mountains farther north, the two mountain ranges are not geologically related, as the Adirondacks are a continuation of the Canadian Shield. Similarly, the Shawangunk Ridge, which forms the southeastern edge of the Catskills, is part of the geologically distinct Ridge-and-Valley province and is a continuation of the same ridge known as Kittatinny Mountain in New Jersey and Blue Mountain in Pennsylvania. The Catskill Mountains are more of a dissected plateau than a series of mountain ranges. The sediments that make up the rocks in the Catskills were deposited when the ancient Acadian Mountains in the east were rising and subsequently eroding. The sediments traveled westward and formed a great delta into the sea that was in the area at that time. The escarpment of the Catskill Mountains is near the former (landward) edge of this delta, as the sediments deposited in the northeastern areas along the escarpment were deposited above sea level by moving rivers, and the Acadian Mountains were located roughly where the Taconic Mountains are located today (though significantly larger). Finer sediment was deposited further westward, and thus the rocks change from gravel conglomerates to sandstone and shale. Further west, these fresh water deposits intermingle with shallow marine sandstone and shale until the end, in deeper water limestone. The uplift and erosion of the Acadian Mountains was occurring during the Devonian and early Mississippian period (395 to 325 million years ago). Over that time, thousands of feet of these sediments built up, slowly moving the Devonian seashore further west. A meteor impact occurred in the shallow sea approximately 375 mya, creating a 10 km (6 mi) diameter crater. This crater eventually filled with sediments and became Panther Mountain through the process of uplift and erosion. By the middle of the Mississippian period, the uplift stopped, and the Acadian Mountains had been eroded so much that sediments no longer flowed across the Catskill Delta. In successive Ice Ages, both valley and continental glaciers have widened the valleys and the notches of the Catskills and rounded the mountains. Grooves and scratches in exposed bedrock provide evidence of the great sheets of ice that once traversed the region. Even today the erosion of the mountains continues, with the region's rivers and streams deepening and widening the mountains' valleys and cloves. Esopus Creek is a 65.4-mile (105.3 km) tributary of the Hudson River, starting at Winnisook Lake on Slide Mountain. It flows across Ulster County to the Hudson River at Saugerties. The Esopus is noted for making an almost 270-degree turn around Panther Mountain, following a buried 6-mile (10 km) impact crater rim. It is famous for tubing, a sport of rafting down a river in an inner tube. Many tubers begin their trip at Phoenicia, New York, and head down the creek towards the Ashokan Reservoir at Olive, New York. The Ashokan Reservoir is part of the New York City water supply system, with fishing allowed under permit, but swimming and most other recreational uses are forbidden. The Esopus Creek is famous for its fly fishing, although in recent years it has been plagued by invasive plants. Another great place to fish is Roscoe, New York, also known as trout town USA. Every April 1 people flock there from all over to kick off the start of fly fishing season. Road and mountain bicycling are popular in the range. Bicycle racing includes The Tour of the Catskills, a three-day road stage race held in Green and Ulster counties each summer, and the UCI Mountain Bike World Cup in Windham. Other cycling resources include the Catskill Scenic Trail, the Headwaters Trails in Stamford and The Round Top Mountain Bike Association also known as Roundtopia which has a large network of mountain biking trails. Several ski centers provide downhill mountain bicycling in the warmer months. Within the range is the Catskill Park, comprising over 700,000 acres (280,000 ha). Catskill Park is part of New York's Forest Preserve. Not all the land is publicly owned; about 60% remains in private hands, but new sections are added frequently. 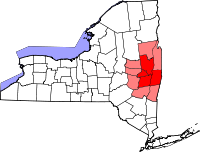 Most of the park and the preserve are within Ulster County, with a significant portion in Greene County, and parts in Sullivan and Delaware counties as well. Many of the trails in public areas are maintained and updated by the New York–New Jersey Trail Conference and the Catskill Mountain 3500 Club. Devil's Path is one of the many trails open for hikers. Spots to camp in the Catskills include Bear Spring Mountain, Little Pond, Mongaup Pond, and North-South Lake. There are five main downhill ski and snowboard areas in the Catskills: Belleayre Mountain (run by the Olympic Regional Development Authority); Hunter Mountain (the first ski area to install snowmaking machines in New York); Windham Mountain; Holiday Mountain Ski and Fun in Monticello; and Plattekill Mountain in Roxbury. Joppenbergh Mountain, in Rosendale Village hosted its first ski jumping competition in 1937. Ski jumping was continued on the mountain until February 7, 1971, when the last competition was held. The Mountain Trails Cross Country Ski Center in Tannersville has 22 miles (35 km) of trails. The Catskill Mountain House, built in 1824, was a hotel near Palenville, New York, in the Catskill Mountains overlooking the Hudson River Valley. In its prime at the turn of the century, visitors included United States Presidents Ulysses S. Grant, Chester A. Arthur and Theodore Roosevelt. Shortly after it was completed, the Mountain House became a regular subject for Washington Irving and artists from the new Hudson River School, most notably artists Thomas Cole and William Henry Bartlett. From 1872, the northern part of the Catskills were served by the Catskill Mountain Branch of the Ulster and Delaware Railroad which was absorbed into the New York Central railroad in 1932. Oneonta to Kingston passenger rail service continued until 1954. Part of the line still exists but now serves only freight. The southern part of the Catskills was served by the New York, Ontario and Western Railroad until 1953. In its last years it ran trains from Roscoe to Weehawken, New Jersey, via Liberty. The Delaware and Ulster Railroad is a heritage railroad, based in Arkville, New York, that still runs a scenic part of the track from Highmount to Hubbell Corners, New York, for tourist use. The Catskill Mountain Railroad is also a heritage railroad in the Catskills, operating from Kingston up to Highmount. A map of the railroads in the Catskill Mountains. Despite what the map says, nearly the entirety of this map is of the Catskills. East of the Hudson River are The Berkshires and the Taconic Mountains, and to the far north (central and northern Albany County, and far northern Schoharie County) are the Appalachians. The Catskills are accessible by automobile from the east along Interstate 87/New York State Thruway, which runs north–south through the Hudson Valley. To the south and southwest, the Catskills are accessible by a variety of highways, including New York State Route 55, U.S. Route 44, U.S. Route 209, and New York State Route 17. Access to the western Catskills is provided by New York State Route 30; and the vaguely defined far-western edge of the region is variously considered to be New York State Route 10 or Interstate 88, though this boundary remains a matter of local preference. New York State Routes 28 and 23A cut east–west through the heart of the Catskills, serving many of the most popular outdoor tourist destinations. New York State Route 23 runs east–west across the Catskills' northern section. The town of Bethel, New York, located in the Catskills, was home to the famous Woodstock Music festival that took place August 15–18, 1969. The event, wherein 32 music acts performed in front of over 500,000 concert-goers, was captured in the documentary movie Woodstock (1970). The site is now home to the world-renowned Bethel Woods Center for the Arts. The many hotels and vacation resorts located in the Catskills are notable in American cultural history for their role in the development of modern stand-up comedy. Comedians such as Rodney Dangerfield, Jackie Mason, and Don Rickles all got their start performing in Catskill hotel venues colloquially referred to as the Borscht Belt. ^ "REGIONAL TOPOGRAPHY". Catskills GIS Atlas. Catskill Center. Archived from the original on 2009-10-29. Retrieved 2009-10-12. ^ "Physiographic divisions of the conterminous U. S". U.S. Geological Survey. Retrieved 2007-12-06. ^ Kudish, Michael (2000). The Catskill Forest: A History. Fleischmanns, NY: Purple Mountain Press. p. 47. ISBN 978-1-930098-02-2. ^ "The Elusive Mountain Lion – E-Files – Our History". Sierra Club. Archived from the original on 2007-08-07. Retrieved 2007-09-17. ^ "Geology of National Parks, 3D and Photographic Tours". USGS. USGS. Retrieved 6 August 2018. ^ "Whitewater Rivers in and near the Catskill Mountains, New York". Retrieved May 10, 2013. ^ "Roscoe New York Chamber of Commerce". Retrieved 2017-10-18. ^ "Tour of the Catskills". Anthem Sports. Retrieved Dec 18, 2013. ^ "Windham Mountain Bike World Cup Festival". Retrieved 2013-12-18. ^ "Catskill Interpretive Center". Retrieved 2017-10-18. ^ "Woodstock Film Commission". Hudsonvalleyfilmcommission.org. Archived from the original on 2013-09-22. Retrieved March 26, 2014. ^ "Comedians who became stars learned their craft in Catskill Mountain hotels". tribunedigital-sunsentinel. Retrieved 2016-01-14. ^ "The Catskills". The Walters Art Museum. Heilprin, Angelo (1907). "The Catskill Mountains". Bulletin of the American Geographical Society. 39 (4): 193–201. doi:10.2307/198709. ISSN 0190-5929. JSTOR 198709. Wikimedia Commons has media related to Catskill Mountains. Wikisource has the text of the 1921 Collier's Encyclopedia article Catskill Mountains. "Catskill Mountains" . Encyclopædia Britannica. 5 (11th ed.). 1911.